Most of Miami is probably familiar with Chef Jeremiah Bullfrog from his popular food truck the gastroPod. Others may know him from his Pop Up and Cobaya dinners where his modern and creative skills are on full display. Jeremiah recently launched a new dinner series called gastroLAB enabling him to utilize his cutting edge techniques. 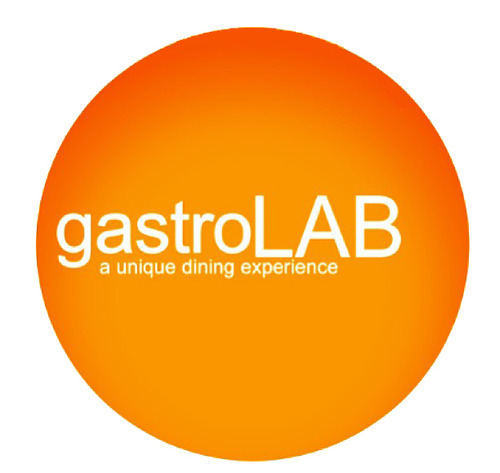 His first gastroLAB dinner was last month at GAB Studio where he pulled the gPod inside and served as his culinary lab. The home for gastroLAB number two was the café at the Wolfsonian Museum on South Beach. I've enjoyed several meals prepared by Jeremiah over the years. But the most recent one may have been his best from start to finish. Jeremiah has guts in the kitchen and always pushes the envelope within each dish. This meal had a great flow from start to finish and each dish was executed perfectly. Each course featured unique and interesting combinations along with great balance, textures and flavors. Everything worked and registered highly on the taste scale. I'm looking forward to numero three. Clarified Negroni with an ice sphere made of bitters and Campari. Cameo appearance by chef Kurtis Jantz. bresaola + kim chi, coppa + melon, lardo + charred golden beet. Great balance, textures and flavors. dumplin's- soy milk, shiitake, egg. Uni, potato, whipped creme, chive. Carrot cake, brisket, licorice, jus. Bite of the night-white chocolate truffle, Pork Fat, sweet potato, ash. Mochi- apple, fennel, brown butter.